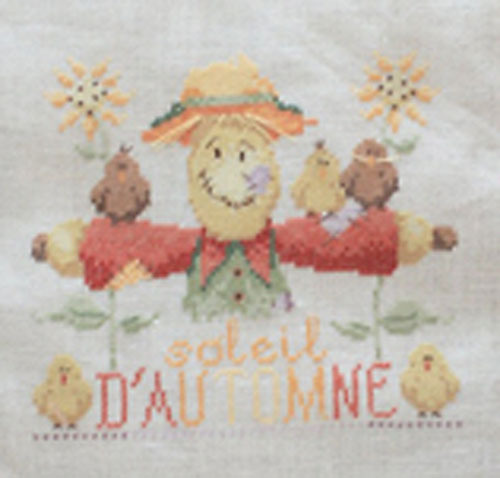 "Autumnal Sun" is a cross-stitch chart with instructions translated in English. Special stitches: This is a cross-stitch design with some straight stitches and a few French knots for the sunflowers' seeds (very clear drawings and instructions on the chart, French knots can be replaced by small beads). This pattern shows 10 colours (DMC references on the chart). The model on the picture has been stitched on a 32 count linen using two strands of cotton over two threads of fabric. Recommended Fabric: of your choice regarding the type (linen / evenweave / Aida) and the stitch count, colour "white" or "off-white", 35x35 cm (14x14 in).